Jorba, O.; Pérez Garcia-Pando, Carlos; Haustein, K.; Janjic, Z.; Baldasano, J.; Dabdub, D.; Badia, A.; Spada, M.
Abstract: The model NMMB/BSC-CTM is a new fully on-line chemical weather prediction system under development at the Earth Sciences Department of the Barcelona Supercomputing Center in collaboration with several research institutions. The basis of the development is the NCEP new global/regional Nonhydrostatic Multiscale Model on the B grid (NMMB). Its unified nonhydrostatic dynamical core allows regional and global simulations and forecasts. A mineral dust module has been coupled within the NMMB. The new system, NMMB/BSCDUST, simulates the atmospheric life cycle of the eroded desert dust. The main characteristics are its on-line coupling of the dust scheme with the meteorological driver, the wide range of applications from meso to global scales, and the dust shortwave and longwave radiative feedbacks on meteorology. In order to complement such development, the BSC works also in the implementation of a fully on-line gas-phase chemical mechanism. Chemical species are advected and mixed at the corresponding time steps of the meteorological tracers using the same numerical scheme of the NMMB. Advection is Eulerian, positive definite and monotone. The final objective of the work is to develop a fully chemical weather prediction system, namely NMMB/BSC-CTM, able to resolve gas-aerosol-meteorology interactions from global to local scales. Future efforts will be oriented to incorporate a multi-component aerosol module within the system with the aim to solve the life-cycle of relevant aerosols at global scale (dust, sea salt, sulfate, black carbon and organic carbon). In the present contribution we describe the status of development of the system and first evaluation results of the gas-phase chemistry. Jorba, O. [et al.]. The NMMB/BSC-CTM: a multiscale online chemical weather prediction system. A: International conference on Harmonisation within Atmospheric Dispersion Modelling for Regulatory Purposes. 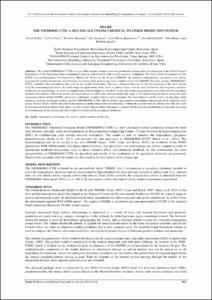 "Proceedings of the 14th International conference on harmonisation within atmospheric dispersion modelling for regulatory purposes: Kos Island, Greece, 2-6 October, 2011". Kos Island: University of West Macedonia, 2011, p. 345-349.